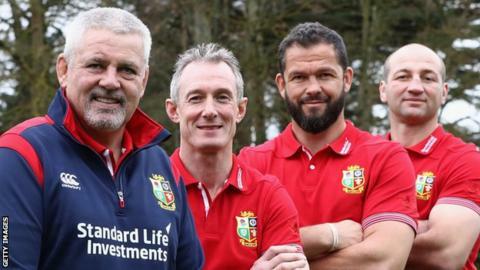 Steve Borthwick, Rob Howley and Andy Farrell will be assistants to British and Irish Lions head coach Warren Gatland for the 2017 New Zealand tour. Howley, who has taken over from Gatland as interim coach of Wales, and Ireland defence coach Farrell have toured with the Lions before, while Borthwick has impressed as England forwards coach. The Lions will play three Tests against New Zealand in June and July. It is the first Lions tour to the country since a 3-0 whitewash in 2005. "I said from the outset it was important to have continuity because we need to hit the ground running, given the limited preparation time," said Gatland. "In Rob and Andy, we have guys who understand the Lions concept, have worked together and know how to coach a winning Lions team. "Steve has done a great job in shaping the England pack and played a major role in their recent run of success, so I'm looking forward to working with him." Borthwick, 37, worked with Eddie Jones during Japan's 2015 World Cup campaign, before joining the Australian's England staff. Farrell, 41, was one of Gatland's assistants during the Lions' 2-1 Test series victory over Australia in 2013. Howley, 46, was also part of the coaching staff for that tour and the 2009 series in South Africa, which the Lions lost 2-1. Former Wales and Lions fly-half Neil Jenkins, who is top points-scorer for his country, is likely to be employed on the tour as a kicking specialist. Role for Olympic hero Ryan? Ben Ryan, who led Fiji to rugby sevens gold in Rio this summer, has emerged as a contender for a role on the staff. There has been no direct contact between the 45-year-old former England sevens coach and Gatland, but the Englishman is thought to be open to a role. He could be one of the additional support staff announced at a later date. "We want to add some specialist people," Gatland explained. "There is no rush. It's a question of speaking to the right people to get their release. "One of the things we learned from the last tour is you're preparing two teams for two games every week, with sometimes two or three training session every day and we need to add to this coaching team." New Zealander Gatland will announce his playing squad on 19 April. "I'm looking forward to the potential that's out there," he said. "Some of the names bandied around have been fantastic, I haven't heard of some of them." Welshman Howley added: "There's a legacy with the Lions and that will be the challenge. The autumn international series put a marker down and now it is the Six Nations for the players to put themselves in the shop window."